Way back in the summer of 1997, I took first steps in creating my F-14 homepage "HOME OF M.A.T.S.". I did it with much enthusiasm and fun, as the F-14 was and still is my favourite aircraft. First I showed a few photos and graphics, added more and more text and images and started to make it the most complete F-14 website anywhere. An impossible task? Not really. I've compiled a lot of information and I do my best to improve it ever more. Over past few years, the website got more and more attention from knowing people and professionals. Aircrews, ground crews and Grummanites* gave me important and valuable input, photographers from all over the world mailed photos to me. 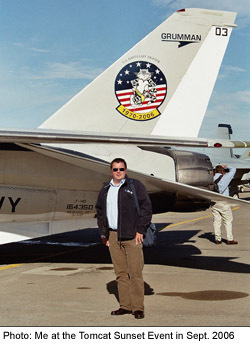 Today, this website and my work and enthusiasm for the F-14 are recognised among others by the Grumman Memorial Park (was awarded my own brick on the Walk of Honor next to the bricks of former Grummanites), and MILITARY.COM appointed this website to a "MILITARY.COM distinguished site". First test pilot to fly and eject from an F-14. Enjoy this website! Everybody who wants to make a contribution to this website is welcome to e-mail me. Read more about Torsten Anft.